While Web research is great, interviews generate insights and spark in your writing that you can’t get any other way. But your interview won’t be successful with a haphazard approach. Follow these four steps to maximize your chance of success: Find ’em, contact ’em, persuade ’em, and interview ’em. Read media with your antennas up. You’re already using strategies to stay aware of news in your space. (I’m increasingly finding out about cool media from my Facebook friends, many of whom share my interests.) As you read these articles, be alert for companies and individuals whose insight you could feature. Target authors. Search Amazon for recent books on your topic. Authors are articulate and enjoy publicity. Pore over corporate press releases and blogs. Who should you talk to at a company you’re targeting? See who’s quoted in their press releases. And company bloggers expect conversation and will typically respond to outreach. For example, when I was looking for an expert on the teaching of writing, I explored the NCTE (National Council of Teachers of English) site, noticed their blog, and identified blogger Millie Davis as a knowledgeable person to speak with. Ask a friend, or Facebook. Tap your contacts at the same company (search your LinkedIn to see if you have any). Or just ask your Facebook followers who might be the best expert to speak with. While you can do this with Twitter, too, it’s less effective unless you have a ton of followers. Search, if you must. Googling is not the best way to find experts, because Google’s algorithm doesn’t surface the most authoritative source, just the most popular. For sole proprietors and small companies, find the “contact us” link. If your target is a blogger, a consultant, or an author with their own site, this is easy. For a larger company, go through PR. Track down the PR contact on the “media” or “newsroom” page. They might be listed, or you might find their info at the bottom of a press release. Treat PR people nicely and they’re happy to help make the connection or suggest alternate people to interview. Search LinkedIn or Twitter. If your target is on Twitter and they aren’t uber-famous, tweet @ them. On LinkedIn, you’ll need a premium subscription to send a message to someone you’re not connected with. Forget asking your LinkedIn connections to contact their connections; that rarely works. And while you can send a Facebook message to a stranger, it goes into a folder people rarely view. Search paid databases. Companies like Zoominfo maintain lists of email contacts, but you’ll have to pay for access. Guess the email. I recently needed to contact old friend Henry Harteveldt at Atmosphere Research Group. I knew the domain and successfully guessed his email address. If you can intuit a company’s email naming convention, it’s worth a shot. If you get it wrong, your email will just bounce. Last resort: try the phone. Even if the target’s phone number is online, it’s a bit pushy to just call or text. And while you can call the switchboard at a company and leave a message, your chances of getting a response are hit or miss. Calling a home phone number, if you can find one, is more likely to backfire than to generate a positive response. Describe what you’re asking for and the deadline. For example, you want a 30-minute phone interview in the next two weeks. Even if your deadline is months off, ask for an interview in the next two weeks. If they’re busy, just push it out a bit. Don’t include the ground rules in the initial email. “This is an on-the-record interview” will just scare people off. If they respond with questions, then you can share the details. Follow up, but don’t be a pest. If I don’t get a response, I generally come back again in about five business days. Give up after three emails with no response. 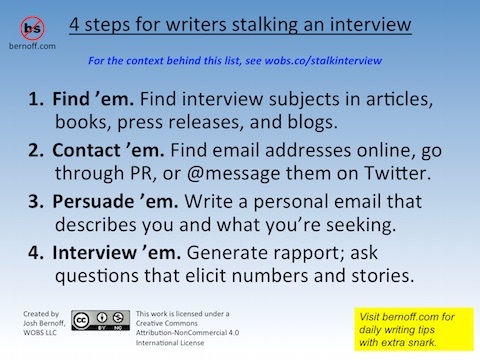 Or you could go back to the “Contact ’em” step and find other ways to reach your subject. You’re only going to have one chance for the interview. Make sure you get what you need. Have all your questions written down, but be prepared to be flexible. With your key questions in front of you, you won’t forget anything essential. But if your subject brings up something interesting, probe deeper, don’t just follow your plan robotically. Start with open-ended softball questions to establish rapport. For example, “How did you get into this line of work?” Or, “What’s the most important way your company stands out?” These are as much about making friends as getting information. Elicit numbers and stories. Numbers buttress points in your writing. If they were they “very” successful, how did they measure that? If they report a “flood” of traffic, how many page views was that? And don’t discount stories. If you can get your subject to tell the strange truth about what really happened, you’ll be able to write in a far more interesting way about them. Ask “what did I miss?” At the end of the interview, ask your subject what else you should know. It makes them feel valued, and might generate a cool insight. Cover ground rules if necessary. By default, interviews are on-the-record. But if the subject is skittish, tell them that you’ll give them a chance to fact-check things before you publish them. I always sneak this in there in book interviews, since it lays the groundwork for the fact-checking stage. Try email or chat interviews if you can’t get ’em on the phone. While phone interviews generate the richest information, an email with six to eight questions can generate a nice blog post and doesn’t require you and the subject to be available at the same time. Chat interviews leave you with a transcript of text to work from. These tips just scratch the surface. Remember, when you’re stalking the interview, your success depends on systematic preparation, perseverance, and discipline. Great interview results don’t happen by accident.